We will cancel today’s practice because the track is covered in puddles and still wet. See you Thursday evening. Thank you to all who completed your registration forms. Stay tuned from our season start up details. As soon as some behind-the-scenes logistics are in place, we’ll announce details for TISC’s 2019 season. The next practice at the Scooter’s Roller Palace is scheduled for March 10th at 9:30am, doors open at 9am. We need at least 7 skaters to go ahead with that practice. Please confirm with me at torontoinlinespeed@yahoo.com or via Facebook (or by phone if you have my # or in person) or via Instagram by Friday evening at 8pm, Please remember to register and to find all the details here. I will announce if practice will happen or not on Friday night. I’ll do so by e-mail to all who are registered plus on the TISC site and the TISC Facebook page. WINTER INDOOR SKATING AT SCOOTER’S! STARTING JANUARY 27TH, 9:30AM, COME SKATE!! Winter skating at the Scooter’s Roller Palace is going to happen this year!! I managed to arrange for skating at Scooter’s on Sundays until the end of March. If you want to skate, please review the following information and complete & submit the following form before attending. EQUIPMENT: You need skates and a helmet the fits securely. It’s indoors, so skin suits are fine, but you might want to have a light jacket on hand as it can get slightly cool. Don’t forget your water bottles. HOW CAN I HELP: Please come early, as early as 9am, to help with cleaning the floor. With four volunteer, it will take us just under 40-minutes to get the floor clean and grippy! I hope to get into the rink by 8:45am to start setting up. WHAT WE WILL DO: Circle drills, passing drills, plenty of relays, speed intervals, how to skate in a group, efficient lines & track patterns, and more. Plus, let me know what you’d like to get our of the program. There will be a wide range in skill, ability, fitness, and experience of skaters, so we all have to do our best to be safe and allow everyone to benefit. WHAT DO I NEED TO DO BEFORE I SKATE? Please complete the following form which will have you skating as a Guest of TISC. You’ll be required to sign-in at every practice. I’ll have a sign-in sheet with pen with me. WHAT ABOUT CANCELLATIONS? I may have to cancel practice due to private bookings and movie shoots from time-to-time. I’ll contact everyone who has registered via e-mail and put a message on the TISC website, Facebook, and my own Social Media feeds to alert you. We’ll see if we can find a different time to skate if there is enough interest. SAFETY: Absolutely no water bottles in the skating area because spills take a long time to dry and make the floor unusable- keep your bottles on the wall near the chair. 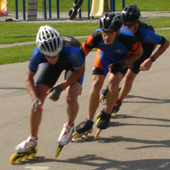 Stay alert and aware at all times- when entering the track, while skating, and when exiting the track. No personal audio devices. When being lapped, hold your line. When lapping others, please alert them and it is your responsibility to go around safely. I’ll have rags and vinegar for you to clean your wheels with as cleaner wheels will offer you a lot more traction. QUESTIONS? E-mail me at one of the two following addresses: torontoinline@yahoo.com or shaloheat@hotmail.com, find me on Instagram, find me on Facebook, and some of you have my phone # to text or call me. Review and agree to the Equity, Climate, Governance, Mission Statement, which outlines rules, expectations, conduct, equipment requirements, safety and more. Review and agree to TISC Guest Waiver. Want to Skate Indoors This Winter? Different options include Monday nights at Scooter’s in South Mississauga and Saturday mornings at Downsview near highway 401 and Keele. Please get in contact with me over the next two weeks so I can figure out if indoor skating this year is possible, including figuring out costs, scheduling, and all those super interesting details!